Tell your fans, friends, and family they can see you at the 2nd Annual National Maker Faire. We’re celebrating our second year of making at our nation’s capital and want to spread the word! Just right click the images below to save or copy and paste the code below to add the official badge, banners, and logos to your own site, blog, newsletter, or any other way you share your Maker news with your community. 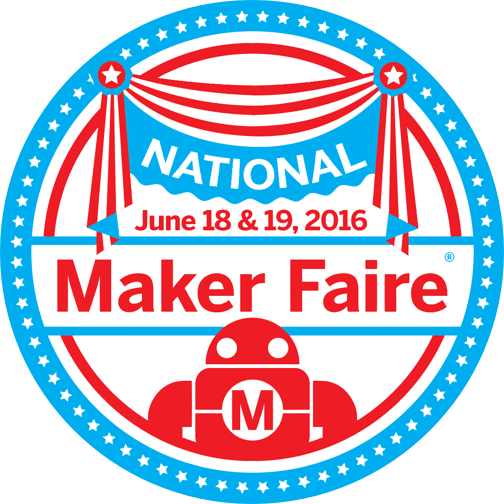 Download and print the pdf(s) of the official Maker Faire printed materials for your office, schools, makerspaces, libraries, local coffee shops, etc. Help us get the word out about this year’s Maker Faire and the Maker Movement with people you know who would love it as much as you do. Here you’ll find the official Maker Faire logos to download and use for promotional purposes. We get asked for our logos all the time, so we’ve posted multiple versions for folks to use, including high resolution ones. The rules are simple: Don’t use them in a way that makes people think we’ve endorsed anyone’s products or services, and when you use one on a website, it should link back to http://makerfaire.com. If you do something neat with them on one of your projects, please let us know. For general Make: badges and buttons, see our Make: Badges page. For general logos, see our Make: Logos page. Click here to download the postcard below to print!